Ricky Bell was born on September 18, 1967 to Dorothy and Daniel Bell. Ricky has six older brothers and four older sisters. Ricky enjoyed playing basketball and listening to Jeffrey Osborne, Michael Jackson, Rick James, and Stevie Wonder while growing up. He started out in a drill band with Ralph Tresvant. Ricky and Ralph would play basketball, do school book reports, and they were even in a school play together in which Ricky stabbed Ralph. They also sang together and were known as the Double R Connection. Ricky was a member of a group called New Edition with Bobby Brown, Michael Bivins, Ralph Tresvant, and Ronnie DeVoe. New Edition performed in many talent shows before being discovered by Maurice Starr and releasing its debut album titled "Candy Girl" in 1983. In the early New Edition years Ricky would mostly sing backup. He did, however, take lead on songs such as "Hey There Lonely Girl," and he sang or rapped on songs like "School," "N.E. Heart Break," and "All For Love." In Bell Biv DeVoe, Ricky sang lead on most of the songs while Ronnie DeVoe or Michael Bivins rapped. By this time, Ricky had been called the music industry's "best kept secret." 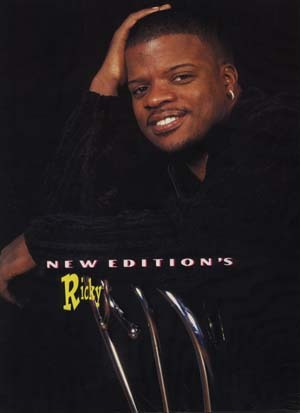 When New Edition released their reunion album in 1996, fans got to hear a lot more of Ricky's soulful voice. Ricky sang parts on most of the songs, and he even took lead on songs such as "One More Day" and "I'm Still In Love With You." Ricky has actually been on several songs as a solo artist. In 1990, he was featured in the song and video for Red Bandit's single "Please Don't Cry." He sang backup on Bobby Brown's single "Pretty Little Girl" on the "Bobby" album in 1992. Then in 1997, Ricky and Ralph Tresvant were both featured on the LL Cool J song "Candy" from LL Cool J's "Phenomenon" album. Though this may be the only song the Double R Connection will do together without any other members of New Edition, the two sound incredible together. Although Ricky is still working on his debut solo album, he can be heard on the So So Def Bass All-Stars Vol. III album singing his own remix of "When Will I See You Smile Again." Ricky's debut solo single, "Spanish Fly," is due August 16th and the album sometime in September. For more information, please see the archives on eurweb.com.